You’re looking at those ridiculously beautiful photos of pie all over Instagram and Pinterest, and now you MUST make one. 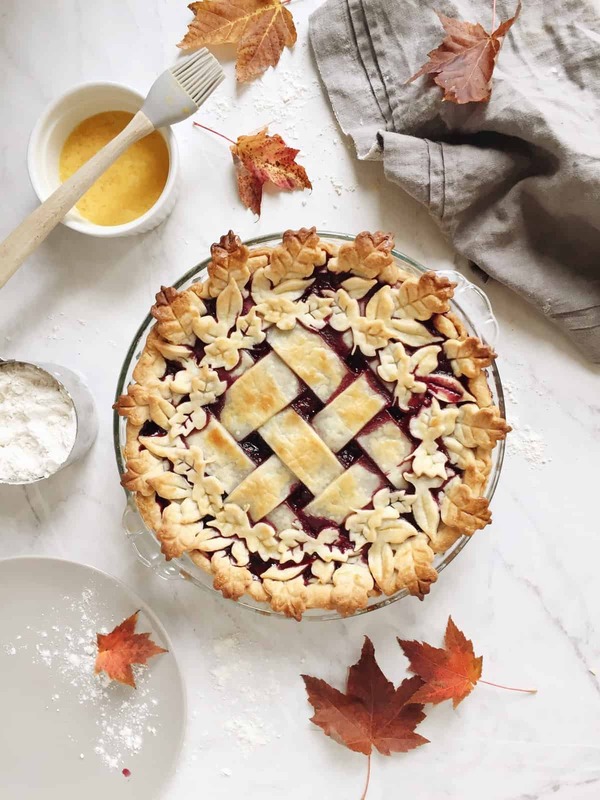 I’ve got you covered and have even prepared a how to make a lattice pie crust video! 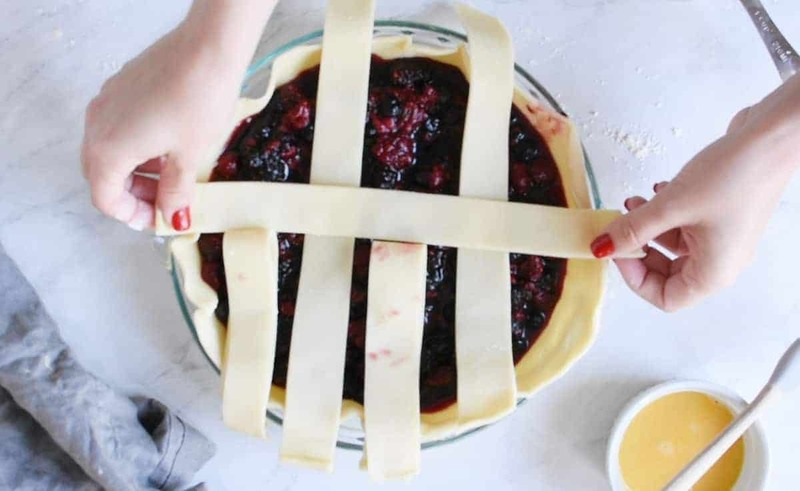 (Because who really understands how to weave a lattice crust without watching it?) 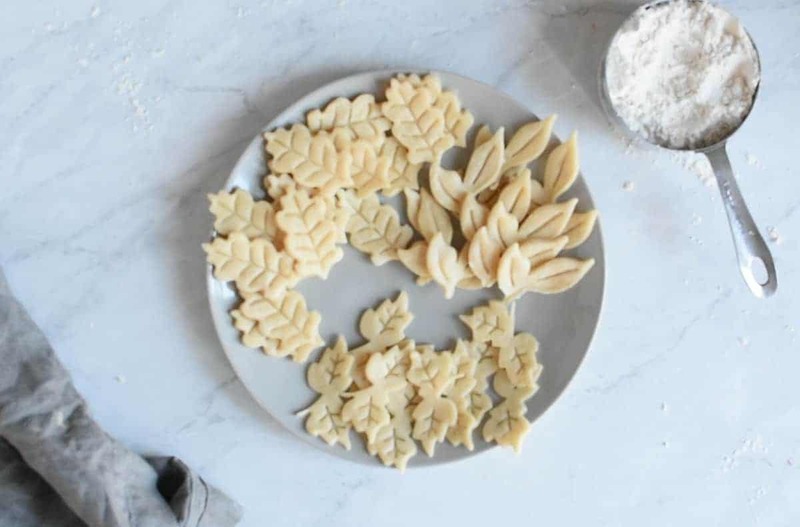 And because it’s the giving season, I’m throwing in how I make my decorative leaf pie crust, too. Move over, Martha! Press play! Bookmark and pin this baby, because this will be your guide for life! And now let’s talk about the subtleties of making lattice pie crust. First of all, the widths of your strips make a difference. Over the years, I’ve come to prefer a larger lattice because it gives more coverage so I can more fully indulge in the flaky crust. But thinner lattice looks more elegant. So, if you’re trying to impress your mother-in-law or the PTA, go with the skinnier strips. Where does the decorative leaf pie crust come in? And it’s all thanks to some extra pie dough and these leaf pie crust cutters. Buy them right now! Beleaf me, It will be the best $10 you’ve spent in a long while. ???? When using these cutters, you must make a clean cutout, and then press down the spring top to get the leaf indents and decorative markings. It might take a couple of tries, but you’ll get the hang of it. 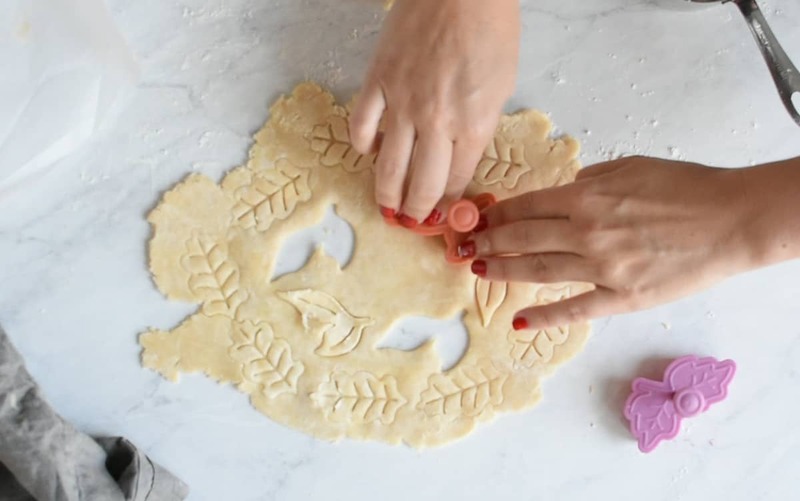 For this particular lattice pie crust with decorative leaf cutouts, you will want 14-18 leaves for the outer ring, 12-14 for the middle ring, and 10-12 for the inner ring. Play around with the designs until it creates a pattern you like best. Also, here’s a little pro tip: slightly overlapping the leaves gives it the prettiest dimension. 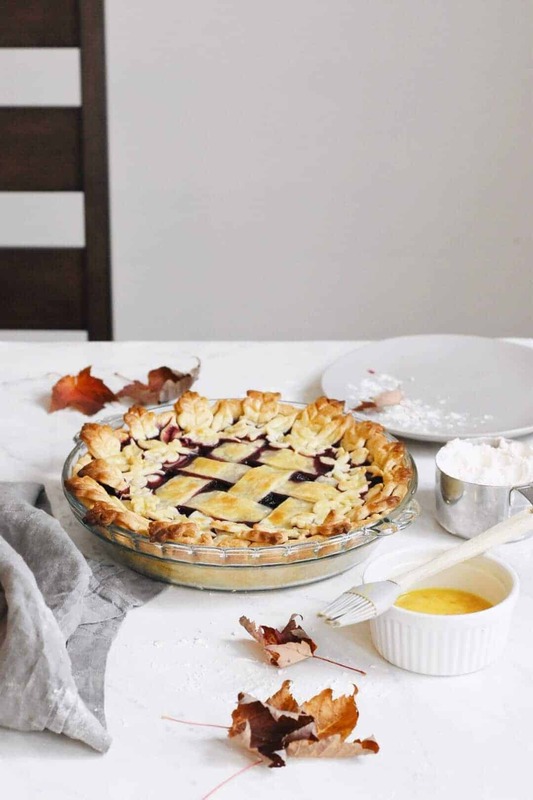 Grab the pie crust recipe and the detailed instructions for the ultimate decorative pie below! 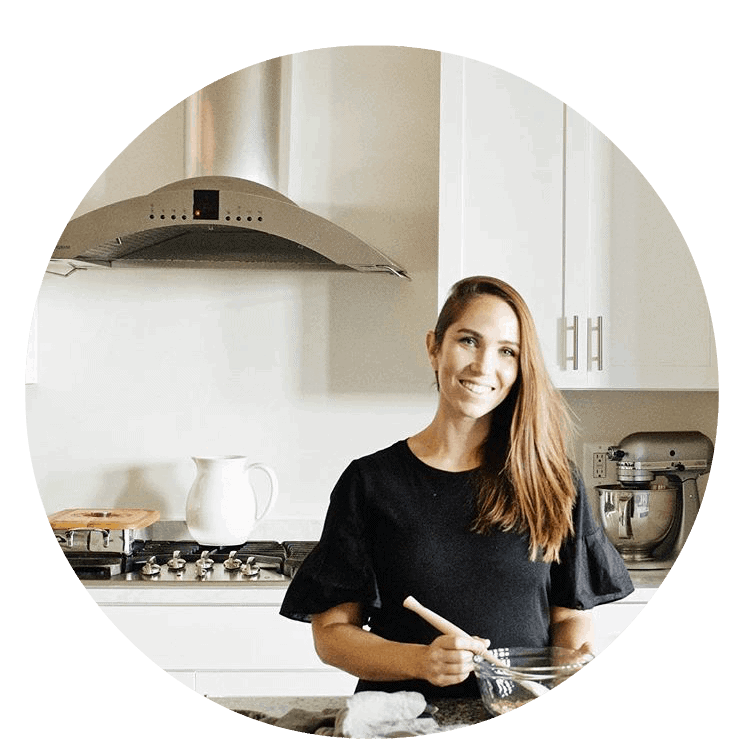 And don’t forget to watch the how to make a lattice pie crust video above. Leave any questions you have in the comments. Enjoy! P.S. If you’re looking for a good apple pie recipe, you need to make this one! 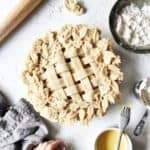 Watch this how to make a lattice pie crust video and learn how to make decorative leaf pie crust. These are perfect for Thanksgiving dinner and the holidays. Add flour, sugar, and butter to a food processor. Pulse about 15 times until the butter and shortening are pea-sized. Pour in the ice cold water and pulse until the dough just barely pulls from the sides and forms a ball. Remove pie dough from the refrigerator. Place the first ball on a well-floured surface and flatten into a round disc. (If needed, roll between two sheets of parchment paper to prevent sticking.) Use a rolling pin to roll the dough into a large circle that will overlap in a pie pan. Gently pick up and place the dough in the dish, using the tips of your fingers to mold it into the sides. Trim any overlapping dough so it's about 1" beyond the edge of the pan. Add filling. Roll out the second dough ball for your lattice crust. Cut 10 strips about 1" in thickness with a pizza cutter. Lay your first layer of five parallel pie dough strips on top of the filling, longest strip in the middle, and shorter strips toward the edges. Space them about 1/2-3/4-inch between strips. Fold back every other strip. Place a perpendicular long pie dough strip in the middle. Unfold the parallel strips on top of the perpendicular one in the middle. Fold back the next set of parallel pie dough strips. Repeat this process with each piece until the lattice is complete. Trim the strips to the same length as the bottom layer of pie crust. Roll the edges together and pinch dough to seal it. Roll out remaining dough scraps. Using decorative leaf cutters, cut out 14-16 leaves for the outer ring, 12-14 for the middle ring, and 10-12 for the inner ring. Place outer leaves on the edge of the crust, about 1/2-inch space in-between each leaf. Repeat this same step with the middle and inner rings, slightly overlapping the leaves. Adjust as needed to make it even and symmetrical. Beat one egg, and brush the egg wash on the completed decorative crust. Bake on 425°F for 30-35 minutes, or until crust is golden. (Cover leaf edges with foil if they begin to get too dark). Absolutely stunnung! Def trying. Where did yoy get those leaf cutters i wonder? Wow, this is simply stunning. I’ve always wanted to be able to make a truly breathtaking pie, and I feel like this is the recipe that has finally inspired me to try. Love it!